Now, new research finds changes in the climate patterns associated with El Niño have shifted and are affecting productivity -- or the levels of things like phytoplankton and other nutrients -- in the Pacific Ocean. The result is causing two species of salmon -- coho and chinook -- that traditionally have different rates of survival in the ocean to trend closer together. 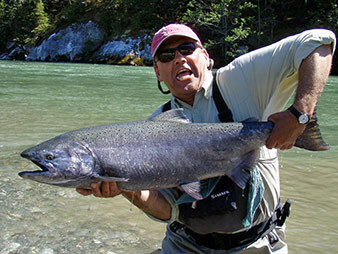 Catching a chinook salmon on the Dean River in British Columbia. Fishermen are just part of the gantlet that threatens the migrating fish. Photo by Sam Beebe, courtesy of Flickr. The study, published this week in PNAS, finds that, since the 1980s, the forces driving El Niños have changed. That shift is what Kilduff and his colleagues assert is affecting the rates in which these two fish species survive in the ocean. In the last three decades, El Niño events have been more frequently associated with central tropical Pacific warming rather than Pacific warming from the east. There is some debate in the scientific community as to if this change is driven by climate change or natural variability, Kilduff said. The latter is associated with the oft-mentioned Pacific Decadal Oscillation (PDO), whereas central tropical Pacific warming is linked to the North Pacific Gyre Oscillation (NPGO). The authors note the mechanics of how NPGO affects ocean productivity and by extension salmon is not as well understood. 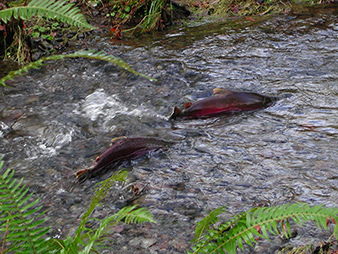 Cool water is preferred: coho salmon running upstream. Photo courtesy of Wikipedia.